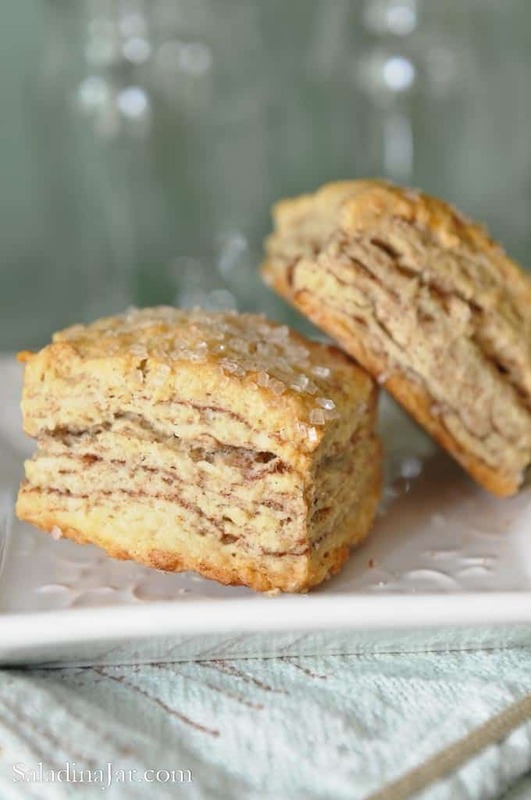 These Flaky Biscuits with a Million Layers of Cinnamon and Sugar may not have a million layers, but it sure seems like it. I wrote the recipe to use leftover whey from making Greek yogurt, but buttermilk makes a dandy substitute for whey. I used to be a whey-waster. Yep, I threw out the yellowish liquid that collects on top of yogurt. We strain it out when making Greek yogurt at home. If you make much Greek yogurt, you’ll soon have a barrel full. But I have repented and changed my ways, due in large part to these flaky cinnamon biscuits. Please note: If you don’t have whey sitting around the house, use buttermilk in the is this recipe instead. They will be just as tasty. Part of the secret is in the rolling-out technique. The original inspiration came from Kate of Cooking During Stolen Moments. Check out the video below for the fine details. (This is my first attempt at a video so don’t laugh or groan too much). Want a quick snack or breakfast? Freeze baked biscuits and microwave them as needed. 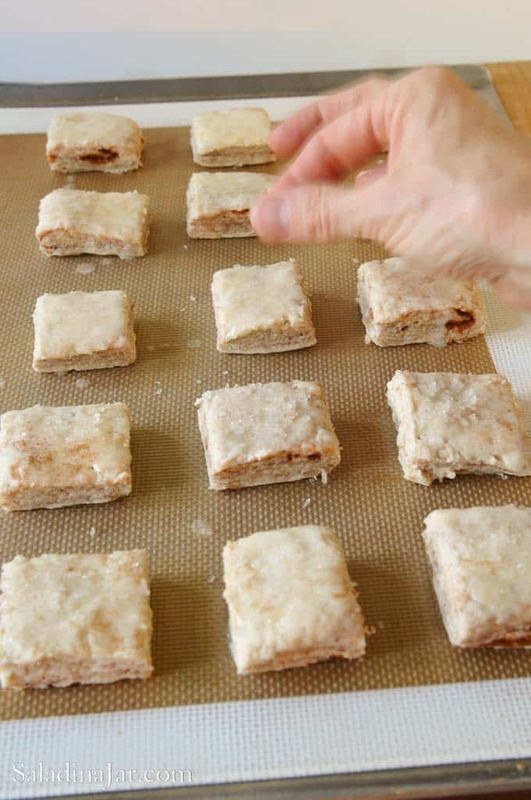 Make ahead and freeze the raw biscuits. Add a few minutes to the baking time. Skip the cinnamon and sugar. Stick with butter only over each layer. Go all the way and make some brown butter icing to pour over the top. 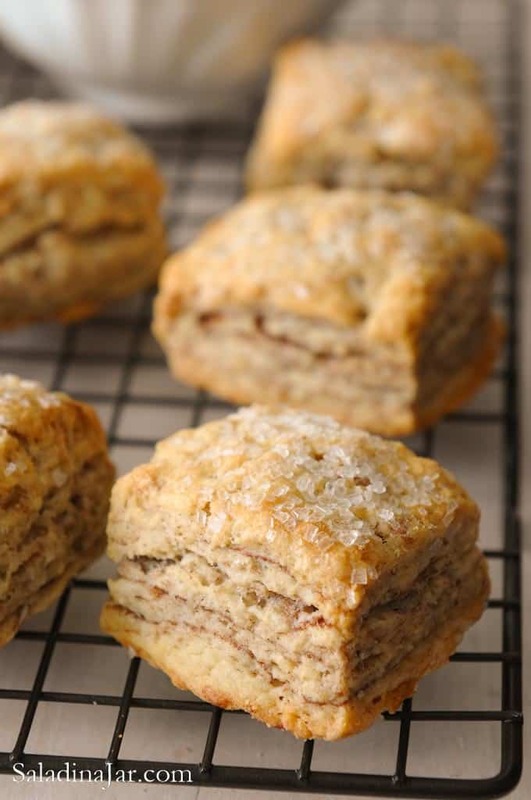 Light and flaky cinnamon-sugar-laced layers set these biscuits apart from the average. Substitute buttermilk if you don't have whey. 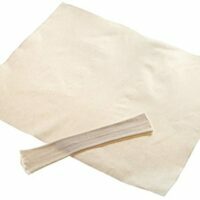 Preheat oven to 425 degrees F. Line baking sheet with parchment paper, silicone baking mat or lightly grease. Place dry ingredients together in food processor bowl. Pulse 3 times. Add cold butter and shortening, sliced into small pieces. Pulse 8 times to cut into flour until you have pieces of various sizes resembling oatmeal, peas, and cornmeal all mixed together. Pour whey over mixture and pulse about 8 times just until mixture starts to stick together. Knead about about 3-4 times until you have a cohesive ball of dough. Use your hands to gently push dough into a square shape. 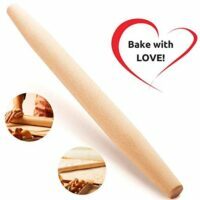 Use a rolling pin to roll out dough about 1/2 inch thick. Sprinkle cinnamon-sugar mixture over 2/3 of the dough. (I like to execute one quick spritz of water on top of the cinnamon to help the layers stick together. Fold uncoated third of the dough over on top of the cinnamon layer and then the other third on top of that one. See picture. Repeat process one or two more times. 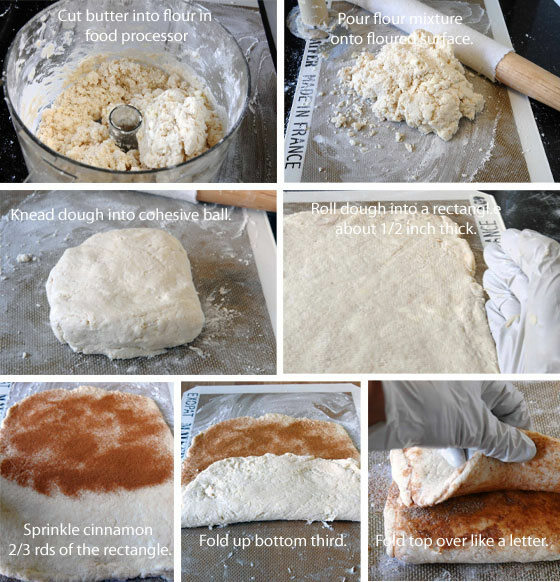 Roll dough to 1/2 inch thick and cut into 12 squares with a sharp knife. Use a greased cookie sheet or one covered with parchment paper or silicone mat. Slice into 12 biscuits and use tip of sharp knife to lift onto prepared pan. Brush with melted butter if desired and sprinkle with regular or sanding sugar. Bake at 425 for 5 minutes. Reduce temperature to 400 degrees for another 12 minutes. Leave out cinnamon-sugar mixture between layers. As biscuits come out of the oven, brush with a mixture of equal parts butter and honey. I found your site when I searched for how to use leftover whey. With that being said, I have never commented on a blog or recipe online. I made these today and I don’t know how I will ever go back to my classic southern biscuits! They’re crunchy, they’re soft, they’re perfectly sweet and not even a little bit dry. They are going to be the perfect dessert for our dinner picnic. Thank you for sharing this recipe! I know that I will be making them again! ….maybe savory ones this weekend! Also, the only thing I deviated from is I used a stand mixer not a food processor. I followed the recipe exactly (with whey not buttermilk). 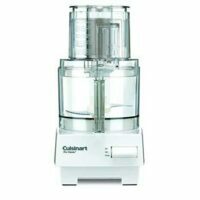 So will this work with out a food processor? Yes, you can stir it up by hand, just like regular biscuits. I made them using my Ninja blender. Good enough to make a double batch–maybe with brown sugar and cinnamon this time and maybe a savory batch as well. Hmmm. Ninja blender….do I need one of these? Thanks for taking the time to write. Made these today. 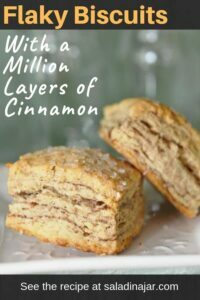 Loved the pillowy insides and crunchy outside, and cinnamon taste, but not sweet enough for me! So I drowned it in maple syrup and ate it with ice cream 😛 Delicious. This is the second of your recipes (the first was the Swedish Apple Pie) that I’ve tried and my first ever go at biscuits, followed it to a T. Very tasty! I wouldn’t change a thing. The rolling out seemed a little tricky at first but the real hands-on approach was a breeze. Mine didn’t look as pretty as yours but still tasted great. Thank you for sharing. Funny bumping into you again. This time I googled biscuit whey recipe and your site popped up as #1 – congrats. I too was looking for a way to use whey and biscuits came to mind. As I tend toward the savory instead of sweet your recipe isn’t my cup of tea – but it’s good reinforcement to see others going down the same path. So I’ve only made 3 small batches so far but I’ll share some thoughts. I’m currently using the eyeball method of measuring (I apologize, later when I get some time I’ll measure everything out and repost), also realizing that whey is acidic the leavening would be CO2, and lastly because I’m not a big fan of baking powder (I get a slight metallic taste, probably using too much) I lean toward baking soda. One limitation of baking soda is the single rise. For me this ruled out the rolled and cut biscuits. Preheat the oven to 450 with the convection fan running. whisk together only until blended, for me I get a big ball of dough in the middle of my whisk as I start to work it, I stop and gently tap the whisk on the side of the bowl to clear the dough ball out, once you have tapped all the dough out of the center of the whisk STOP. Immediately using a tablespoon or appropriately sized scoop put as much as you need to make the sized biscuits you want. I have let the portioned biscuits sit on the counter for 15 minutes to let the rise increase, and I’ve baked them right away with no discernible difference in the final product. Depending on the size of you biscuits and the temp of your oven, cooking times vary slightly. For me with a heaping tablespoon size biscuit I put them in the oven, reduce the temp to 325 and let them cook for 11 minutes, for half cup sized biscuits I cook them for 12 minutes in the 450 oven. They should be medium brown on the rough edges. Best served right out of the oven, but if you are making them ahead be sure to brush the outside with melted butter to keep them from getting too crispy/dry. Adding appropriate herbs to match with your entrée or finely shredded cheese is encouraged. NO I didn’t forget the salt! Between the whey, butter (salted) and baking soda there seemed to me to be enough salt/sodium to bring the flavors out without adding additional – but feel free to salt to taste. Interesting Gary. I make a savory version of these too–with baking powder. I must try your way when you figure out the exact measurements. This looks helpful. Please can you repost with quantities? I don’t feel confident enough to do this by eye. The quantities are still there. Keep scrolling down until you see it. Thanks for writing. As it turns out, the You Tube video I had posted there wasn’t showing up and I didn’t know it. I was able to fix that problem. Let me know if you still can’t see the recipe. I made yogurt from scratch for the first time last night. It tastes better for about half the price of store bought, and while it requires a lot of waiting, hands on time was minimal. After straining to make “Greek yogurt”, I wondered what to do with the leftover whey (other than pouring it down the drain), and found this site. I just finished making the biscuits. I’ve made (and eaten) a lot of biscuits over the years–but I agree–these are the tastiest, lightest, and TALLEST biscuits I have ever made. Congratulations on your successful yogurt. I see many more good batches in your future–along with good biscuits. Thanks for writing. Oh my…..these are fabulous. 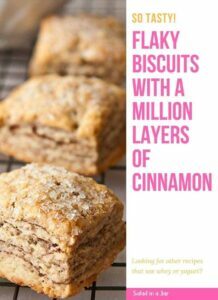 I’ve always wanted to make really flaky biscuits & your instructions are very easy to follow. Eating one right now !! And I posted on my blog, too. So glad I found you so I can try even more of your creations. Next is skinny sweet potato chips. I made these this morning, and they taste wonderful, despite my making them all wrong! The dough wouldn’t fit in my tiny food processor so I cut in the butter (and coconut oil instead of shortening) with a pastry cutter, and then I definitely handled the dough way too much…plus, I was confused by the recipe and didn’t realize I was supposed to mix the cinnamon with the sugar for the inside layers (since the instructions just said cinnamon, I figured the sugar was all for sprinkling on top). I just put cinnamon inside. In spite of all this, they are lovely. I might not even mix the cinnamon and sugar in a future batch because I like the less sweet taste (shocking, for me!). Thanks for helping me use up some of my whey! So glad your biscuits turned out despite the confusing directions. I appreciate your feedback and will go back over that recipe to make them a little clearer. I think I mentioned something about a honey-butter version at the end of that post that doesn’t use cinnamon and sugar and they are delish! Have been on vacation all week, and just made these this morning to welcome myself into my final day of rest. Wow! Very very soft and so flaky! Not as sweet as I thought they’d be, and I used more than you suggested. Still, fantastic recipe! Hi Connie, Yes, I would roll out the dough in the same way. 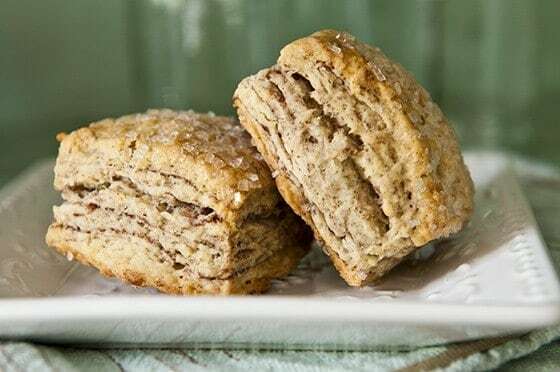 The previous post on ways to use whey has a picture of the biscuits rolled out the same way without cinnamon and sugar. I just brushed the tops with butter and honey but that is optional too. The roll and fold method works like magic for me and doesn’t have to be precise at all. Megan, You inspired me on the video. I’m afraid I’m a whey waster too! I will try and reform now that I have a good use for it. that was a fantastic first effort on the video! i’m super excited to give these a try! thanks for sharing all your tips and techniques. You have some amazing recipe’s. Could you please tell me what camera you use? your photos are amazing, they make me want to lick the screen!! I love these biscuits, Paula! I have made Greek Yogurt very frequently and will love to use the whey for these. Thanks for sharing all the amazing ideas to use the whey. Wow, Paula these are right up my alley! They look wonderful and flaky and such a good use of your whey. I would go for the icing since I have such a sweet tooth, this is on the to try asap list. I don’t eat yogurt so I don’t make it but I’m going to make these biscuits one day using the buttermilk as you suggest. They look too good to pass up. Good for you for coming up with this recipe! Wow. You are a movie star now-or at least your hands and voice are! That was so amazing and awesome. I loved it and love the recipe. Nothing better than cinnamon on something for me. I have to try these!! I LOVED the video!!!! I could actually use a video for all your recipes! I will make these for our Sunday get together. I will do a trial run of course.